Keeping your business profitable is a challenging task. There are hundreds of aspects that affect your profitability, and you can even be unaware of some of them. Inventory management is one of the key elements that you have to focus on crucially. When it comes to managing your liquor inventory, you all know that bookkeeping the number of bottles left is never enough because after you open up a bottle, you should also keep an eye on how many drinks are left in that bottle. It might seem hard to track down the amount of servings that are in the bottle at the end of the day, but there is an easy way to do this and it just requires simple math. Let’s say that your bottle is 750 ml, and the amount you use from that bottle is 1 ounce for every drink you make with it. 1 ounce equals to 29.57 ml, by having that information you can divide 750 ml by 29.57 ml and get 25.36, rounding to 25 which is the number of drinks your 750 ml bottle has. Now, here is the tricky part; after you open up a bottle and start pouring, you have two options for keeping track of the amount left after each use. Depending on the example above, the first option is to have a 25 column chart where you check each column after you use the bottle. For the second option, you have to calculate the remaining liquor/spirits in approximate percentages. Let’s say you have 80% remaining of a 750 ml bottle. As you know that there are 25 x 1 ounce in that bottle, so you multiply 25 by 80% (which is 0.8), and that equals to approximately 20 drinks remaining. Here is a little cheat chart for you to have a more clear idea. 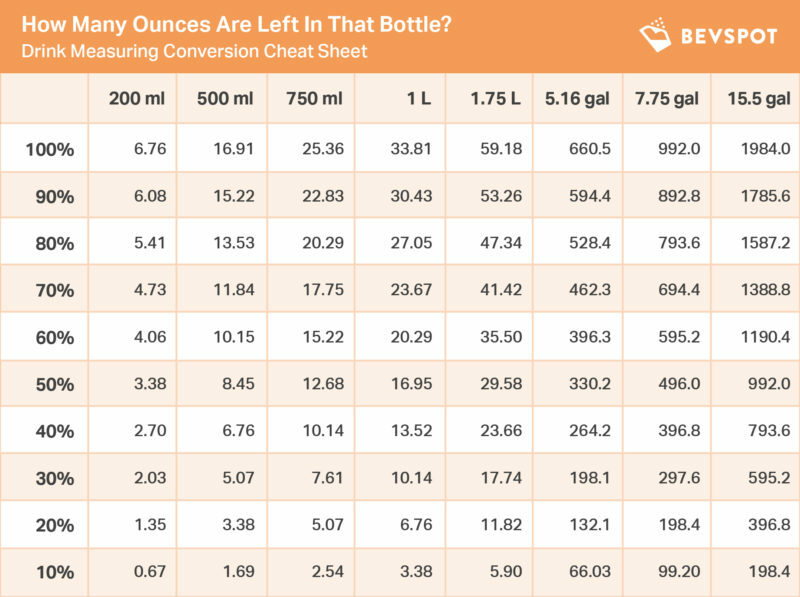 To calculate the number of shots left in a bottle, check out our Are You Getting the Most Out of Your Bottles article.